There's a fair amount of moving the goalposts in professional investment management. Once upon a time, commodities were the must-have asset class for sophisticated investors. A portfolio of traditional asset classes (stocks and bonds) just wasn't going to cut it. You had to have alternatives. The chart above shows how that's worked out. Commodities have crashed and burned, losing 65% cumulatively since 2008 (so much for that "inflation hedge")! 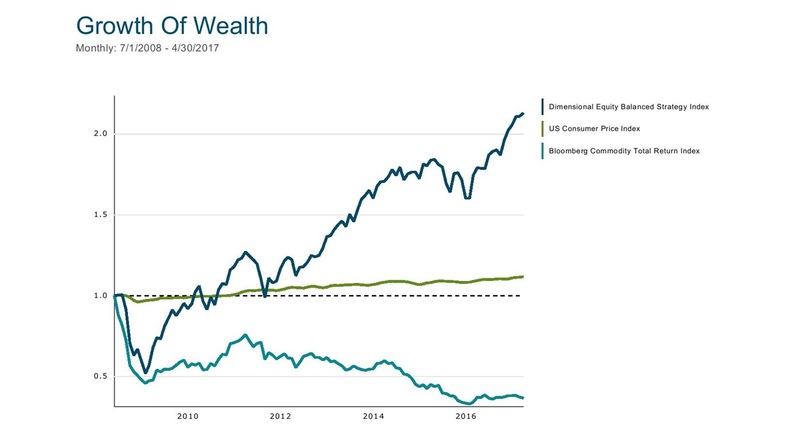 Surely, any sane investor or advisor would have learned their lesson, opting to stick with tried-and-true asset classes? Nope. Alternative allocations aren't going anywhere, proponents have just moved the goalpost. We're on to "Alternatives 2.0." Managed futures, long/short factor funds, reinsurance, private lending...and the list goes on. Ask some advisory firms, and they'll show you a backtested portfolio with a slug of the latest alternative assets going back to 1973. If you squint hard enough, you can see a few dozen basis points (tenths of a percent) of better results. It's all fantasy, of course. Just as the simulated results of commodities prior to the early 2000s were unreliable, so are the backtested returns from the new batch of alternatives.